Nikon's taken a conservative approach with the D80. Rather than go for a wild new look and a truckload of gadgetry, the company's built on a tried-and-trusted design. Things had become pretty static in the entry-level SLR market. We'd all got used to 6Mp cameras or 8Mp in the case of Canon and Olympus) and the trend seemed to be towards lower prices rather than higher specs. And then, in the space of just a few short weeks, we get the Sony Alpha A100 , the Nikon D80 and - just announced - the Canon EOS 400D. Each has ten million pixels, a resolution which looks set to become the new standard for semi-serious digital SLRs. 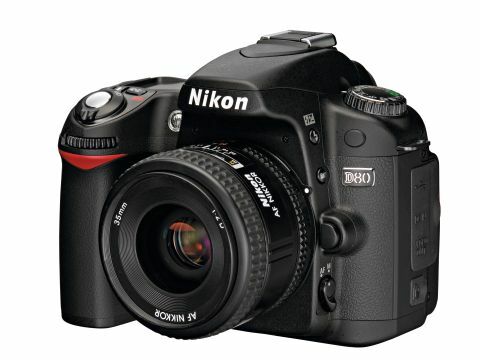 For the time being, Nikon looks set to carry on with its 6Mp D50, so the D80 slots in above this but below the D200. It replaces the D70s, which was, admittedly, starting to look long in the tooth, not to mention expensive. And Nikon has judged this pretty well, in that the D80 may not steal many sales from the D200 despite its features. You only have to compare the two cameras in the flesh to see the difference. The D200 is built like a tank, with controls for serious photographers and pros. The D80 is built like the D50 and D70s - chunky but plastic, with amateur-orientated Vari-Program modes up front on the mode dial and more serious photographic options tucked away in menus or accessed via buttons. The D80 is for amateurs who want to take their photography further; the D200 is aimed at skilled photographers who want hands-on control of features they already understand. This raises another question. Is the D80 sufficiently superior to the D50 to justify a doubling in the price? There are two ways it can do this: by offering superior photographic control or practical benefits, and by providing significantly better image quality. Let's look at the D80's features. The 10Mp CCD is the headline news, but this inevitably brings bigger file sizes which, in turn, places greater demands on the camera's internal processing hardware. Nikon claims that a new processing chip accelerates performance while reducing power consumption, and this appears to be the case. Despite the bigger files, the D80 can still shoot at 3 frames per second practically indefinitely. Well, almost. It can shoot up to 100 JPEG files in succession at this speed - a little down on the D70s (and the D50) but still a figure few of us are ever likely to exploit. The battery life is pretty good, too. Nikon has a habit of quoting two figures: one based on continuous shooting in a very specific set of conditions and another based on what appears to be a more reasonable simulation of what most of us do. The battery life figures quoted are 2,700 shots and 600 shots respectively. Even if you get 600 shots on a single charge, you've not got much to complain about. What's more, the battery charge indicator on the status panel is backed up by some careful battery charge measurements within the camera. When the charge icon moves off maximum, it doesn't mean (as it does with most cameras) that the D80 is about to drop dead at any second. In fact, the charge indicator has several segments which do a pretty good job of mirroring the battery's true state. And if you're not convinced, you can dip into the menus to check the battery's charge level as a percentage, and also the number of charge cycles it's been through (and hence whether you need to replace it at some point). Nikon claims too that the D80 includes a number of features from its pro SLR range, including 'colour independent analogue pre- conditioning'. Whatever that is. Incidentally, any D50 or D70s owners who couldn't help crowing over their cameras' extraordinarily high (compared to rivals) 1/500sec flash sync speed should keep quiet now. The D80 has dropped down to 1/200sec. There are two new lenses, too, though these were not available at the time of going to press. One is an alternative 'kit' lens - a 7.5x 18-135mm zoom, while the other is a 70-300mm VR telephoto zoom. We tested the camera with the cheaper kit lens option - Nikon's long-running 18-70mm zoom. Nikon, as many photographers may be aware, underestimated the demand for its 18-200mm VR lens and many people are still struggling to get one. There's been some heated discussion on this topic by those who've been disappointed. Nikon claims that it's learned its lesson and that production of the 18-135mm zoom has been ramped up. Nikon says the D80's viewfinder has been taken from the D200 and that it's larger and brighter than the one on the D70s. There's no doubt about it - it's noticeable as soon as you put the camera to your eye. It's not just the viewfinder that's had some attention but the LCD too. Like Sony's A100, the D80 sports a 2.5-inch LCD with 230,000 pixels - it's not just big, it's sharp too. What's more, this unit has an unusually wide viewing angle so that the display brightness remains the same whatever angle you look at it from. Overall, the handling is very good. The D80 has two control wheels ('command dials') rather than the single dial you get on entry-level cameras and this is more of an advantage than you might imagine - notably when adjusting shutter speed or aperture when the camera is in manual mode. Startup is so fast it's all but instantaneous. It's quiet too, unlike the noisy and slower Sony. The autofocus is quiet and fast thanks to the Nikon 18-70mm lens. This is in contrast to the noisier AF of the Sony. We mention this because these two cameras are bound to be seen as rivals. Quite apart from any difference in image quality, though, there are clear differences in the user experience. The A100 is rather coarse; the D80 is as sweet as a nut. But it's not perfect. Chunky though it is, the D80 is still lacking in height, so that when you've got the camera gripped in your right hand, the little finger's got nothing to do but hover rather ineffectually under the baseplate. This isn't helped by what seems to be a rather contrasty tonal rendition. Try to shoot whitewashed cottages in bright sunlight and you'll see. You can reduce contrast manually via the custom settings in the Optimize menu, or choose the softer colour mode, or you could shoot RAW and try to sort it all out later at your computer. There have been enough complaints about the rather dull, flat tones of the D70s, but the D80 maybe goes a little too far in the other direction. You can try different metering patterns, of course, and this is easy enough on the D80 - you press a button on the top and rotate the relevant command dial. In centre-weighted mode you can even adjust the size of the 'centre' zone. But the D80 does continue one somewhat odd Nikon trait... Why can you only adjust the shutter speed and/or aperture while the meter is active? At first, this quirk prompts a vague grunt of disapproval - you blame yourself for forgetting. But you slowly get more and more annoyed. Why should you have to half-press the shutter release to fire up the meter just to apply basic camera adjustments? We've mentioned the speed and the near-silent operation of the autofocus; it's also worth pointing out that the D80 has a refined 11-area AF system with the Nikon's usual range of focusing modes. These split into two areas where you can choose which focus points are used and where you can opt between single-shot AF and continuous AF. This does all start to get a bit complicated, and the jargon doesn't help. You'll have to spend a little time with the D80 manual to work out the significance of 'dynamic area AF' versus 'auto area AF' and how this fits in with single-shot AF, continuous AF and predictive focus tracking. There's a similar problem with the colour/ tone or 'optimization' settings. You can use the Vari-Program modes to match the tonal response to the subject, or achieve a similar thing with the 'optimization' menu when using the P, A, S and M modes, and then within that menu there's a 'customise' setting with the ability to choose between mode Ia, mode II and mode IIIa as well as manual contrast, saturation and sharpness settings. It's not just the level of complexity, which is bad enough, but the fact there's no clear indication of how these different modes interact. It's tempting to leave everything at the defaults and hope for the best. It's interesting to compare shots taken on the D50 with those from the D80. The D50's images have always been very sharp, almost to the point where CCD artefacts and moire start to become a problem - it's possible that the D50's sharpness comes from a weaker anti-aliasing filter. The D80's rendition is softer but, thanks to the increased sensor resolution, still resolves more detail - enough to make the D80 worth the extra cash. But what's the D80 like compared to the Sony A100? We've mentioned that the D80 has a better 'feel', but it's more expensive, of course, and lacks Sony's anti-shake system. But the 8-70mm kit lens with the D80 is better than Sony's 18-70mm zoom and this contributes towards the overall image quality, where the D80 comes out ahead. The Sony will save you money, of course, so you may end up facing one of those dreaded head- versus-heart decisions.